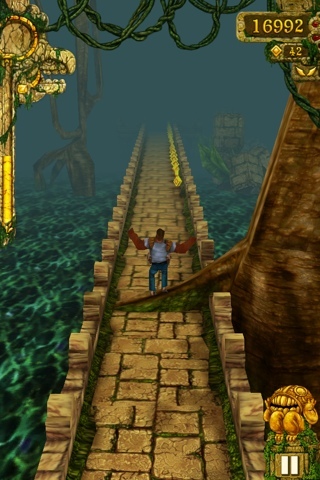 Temple Run is kind of an oddity in the AppStore, but it's a big hit. The graphics look a bit too "fancy" which put me off at first (they aren't high-end enough for you to say wow nor are they simple, they're in a weird spot in the middle), but the game play itself is so simple and fun that this game quickly became an addiction. The concept of Temple Run is very simple (way more simple than it looks): you need to control your character to avoid obstacles (jumping, sliding, moving to the left/right) and therefore run as far as you can. You get one chance to mess up: you hit an obstacle and you're out. As you run you can collect gold coins that can be later used for buying power ups.